With the season entering the closing stages, EA Sports continue to provide us with some fantastic in-form player items. As the stakes get higher, the performances only seem to be improving. That has led to some cracking players getting a spot in FIFA 19 TOTW 30. There are three Premier League players amongst the bunch, while a certain Bayern Munich striker has been handed a stunning 94 OVR card. Take a look at the squad in full. Robert Lewandowski is undoubtedly the star name in this squad, with his 94-overall rating making him one of the best players in FIFA 19. While his pace has been a weakness at times, his 85 rating in this card will make a big difference. Couple this with shooting and dribbling of 93 and 92 respectively, and you have a player who will be very difficult to stop. Heung Min Son is the pick of the Premier League players, with his central position making him a very appealing option. He has been given a typically well rounded item, with no real weaknesses for an attacking player. Jamie Vardy's pace is sure to make him a popular choice in the coming weeks and his finishing rarely lets him down once he gets into a scoring position. Phil Jagielka completes the contingent from the English top flight, being rewarded for his winner against Arsenal at the weekend. Sevilla's Pablo Sarabia will be an excellent option to have out wide, while Anderson Talisca would slot nicely into a squad containing other Brazilian players. Josip Iličić is an interesting prospect to have up front, although he may be better suited when slotting into a slightly deeper role. 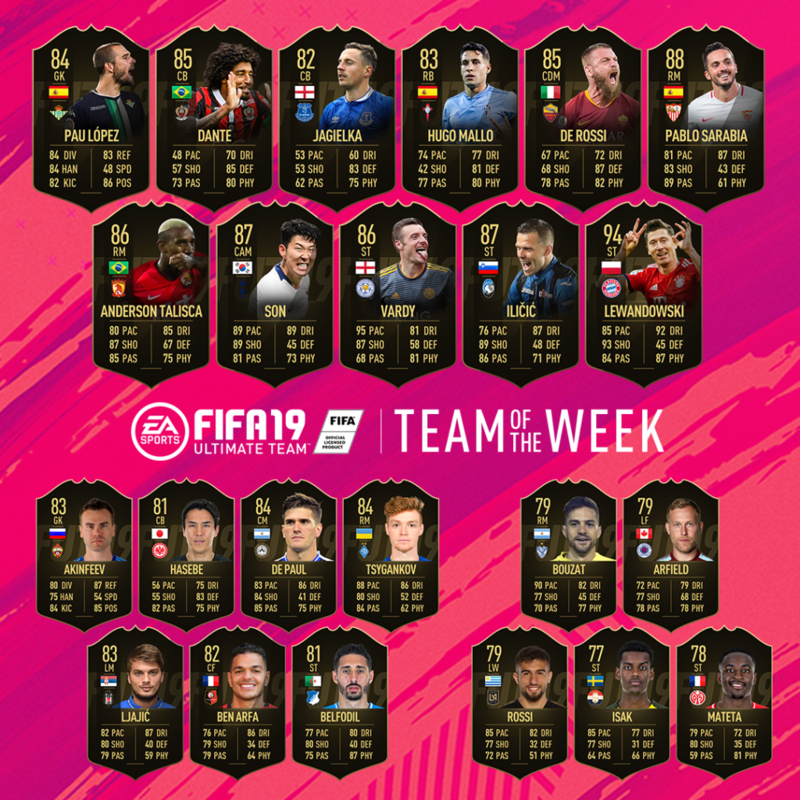 TOTW 30 will be available in packs from 10th April at 18:00 BST until 18:00 BST on 17th April.